Points North is a band that has just released their second, and self-titled album, following on from their debut album released in 2012, Road Less Traveled. Influences for the band comes from the likes of Rush and Joe Satriani, and although I really dislike trying to put bands styles into little boxes, the best description of Points North sound would be melodic guitar driven rock. Album No1 was an instrumental album, but Points North have stepped up to the mic with album No 2 and added some vocals. The band is a 3 piece outfit comprising Eric Barnett (guitars), Uriah Duffy (bass) and Kevin Aiello (drums) who are all experienced musicians and between them have tutored, been session musicians, played in a well-known band (Whitesnake) and shared the stage with Paul Butterfield Blues Band and Etta James. Points North, the album, contains 11 tracks and has around 53 minutes of music on offer. The longest and shortest tracks on the album are “Turning Point” and “Child’s Play,” lasting 7:15 minutes and 3:25 minutes respectively. The opening, well titled, track, “Ignition” (3:58), blast out of the speakers from the word “Go” and continues to power along with some slight tempo changes. Guitarist Eric gets to showcase some excellent riffs ably backed up by Uriah and Kevin on bass and drums respectively. At a touch under 4 minutes in length, it certainly does not outstay its welcome and is too soon over. A blistering opening to the album, but as this is a mainly instrumental release can the band maintain this level of listener interest? “North Star” (4:38) is a more laidback style of track with more of the excellent guitar work by Eric. Latterly in the song there is an amazingly atmospheric passage. “Child’s Play” (5:18), “Sky Punch” (3:26) and “Rites of Passage” (5:26) are all tracks that combine the heavy driving edge of rock, tinged at times with some extremely melodic atmospheric passages. “Colorblind” (3:53) sees the band venturing into the vocal side of things and although passable, the vocals are not earth-shattering. The music follows the path of previous tracks and I don’t feel that the lyrics add another dimension to the music. Next up, “Harlequin” (5:08) is an almost folky, jazz influenced track which again highlights the skills of this tight unit of musicians. The final quartet of tracks, “Turning Point” (7:15), “Red Eye” (4:42), “Foxes and Cougars” (5:19) and “Killer Pounder” (3:43) hold no surprises after what has already gone, but the band vary the “heaviness” within and between tracks to maintain the interest. 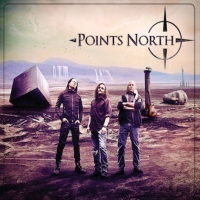 Points North is an extremely enjoyable rock album which, having posed the question about interest levels and instrumentals earlier in the review, successfully navigates through the minefield and maintains the listeners’ attention. Enjoyable as Points Northis however, it doesn’t have that spark that lifts it to a greater level. Good solid rock, played by enthusiastic, skilled and experienced musicians is a worthwhile listen and should get many rock fans parting with some money to add Points North by Points North to their collections.